Welcome! I appreciate you taking the time to learn more about me, Nancy Bleeke. FOUNDER and PRESIDENT of Sales Pro Insider, Inc., a firm focused on sales training and HR solutions since 1998. AUTHOR of Conversations That Sell, Collaborate with Your Buyers to Make Each Conversation Count. This book, the result of my career in sales and sales training, was written to help you have more productive and collaborative conversations – conversations that lead to more business, referrals, income, and satisfaction in your job! EDUCATION: BBA and MBA degrees from the University of Wisconsin school systems. BLOGGER and WEB-ISTA: Timely tips for sales and communication success are shared in my blog and through my newsletter. PASSION: Building performance, profits, and people. Today I am an author, professional trainer, speaker, facilitator, and president of Sales Pro Insider, Inc. I have interviewed, trained, and coached thousands of salespeople around the globe, from Fortune 100 companies to small family-owned businesses, imparting the skills and belief that selling is helping others do or decide something. Yes, my belief is that simple: Selling is helping someone else make a decision or a commitment to do something. And who isn’t selling in that way every day? My passion is advancing the world of sales and customer service so that more people – on all sides of the transaction – get what they need from each conversation. It wasn’t always this way. In college I knew I wanted a career that helped others and allowed me to succeed as well. I earned my BBA and started work in HR. It wasn’t challenging enough so I tackled the MBA program. Now that kept me on my toes while working full time! Yet when I completed the MBA and continued with my HR career, I found myself drawn to and working with salespeople and sales leaders. But I still didn’t want to be one of them – I had hung on to negative perceptions of sales that I had since growing up in Kenosha, Wisconsin, a blue-collar town where manufacturing plants such as American Motors, Jockey International, and Ocean Spray were plentiful. I didn’t know many people in sales. And those that I did weren’t always talked about in the nicest way. I ended my HR job and jumped feet first into 100% commission sales – selling training solutions! In the first year I was Rookie of the Year and I was hooked. I was the formerly reluctant salesperson who also excelled at teaching others how to sell conversation by conversation. For over 15 years I have devoted my career to helping people – and companies – embrace a sales culture, increase their sales abilities, and accept the rewards that come with it. And yet the past few years have changed the actual conversations that buyers and sellers have. Too much time, energy, and effort is wasted on unproductive conversations, and I decided to do something about it! I decided to share my message – and the best practices I’ve collected along the way – with you. The book, Conversations That Sell, Collaborate with Your Buyers to Make Each Conversation Count, details the what, how, and why of effective and efficient conversations that count for all involved. Oh, and for those of you who like to know the personal stuff – I live in Wisconsin with my husband, Jon. We are facing the empty-nest years. Our oldest son is in college, our second is in the Marines, and our daughter will soon be leaving for college. That leaves me with a lot of time to continue my lifelong journey of development… and I’m very excited. 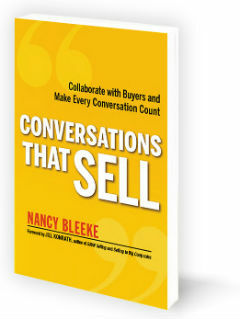 To learn how to better collaborate with your buyers, click here to buy the book. Learn more about the author, Nancy Bleeke. Access tools you can incorporate into your selling activities to make each conversation count. This helps me to collaborate and solve my clients problems instead of "selling" them. © 2019 Conversations That Sell. All Rights Reserved.